Live with intention. Walk to the edge. Listen hard. Practice wellness. Play with abandon. Laugh. Choose with no regret. Continue to learn. Appreciate your friends. Do what you love. Love as if this is all there is. 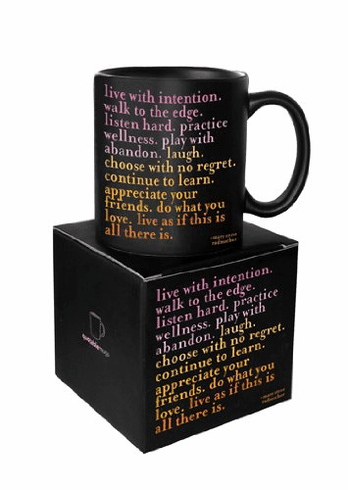 Quotable's wonderful quotes and distinct style are now available in the high quality 14 oz. ceramic matte finish mugs. Dishwasher Safe! The mugs are individually gift boxed for gift giving.